The world we live in! : Everything I do! 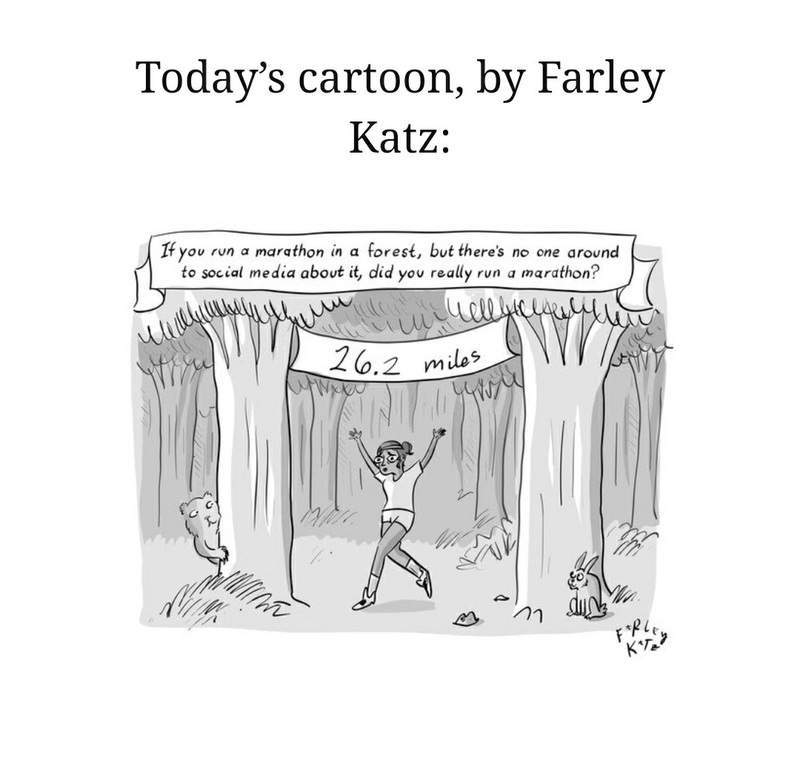 This cartoon appeared in the New York Times today. I found this at such an appropriate time. I was in the midst of thinking about every action i take. It could be the smallest action and I would be sitting on the bed or on my sofa or standing and thinking, 'Why am I doing this.' It could be something as simple as going for a run or a walk, and after all the hours put in suddenly one day, i start asking myself, 'Should I run today or do yoga, or should i sit and sing, should I write, or should I cook something.' With all these options creating a kind of anxiety in me, I would just start browsing my phone, for hours. It was much better than deciding about a life crisis, 'What should I do'. It was much better than that. Mindless browsing provided an instant gratification and a much needed distraction from an important question. So, did I go for the run? No, I didn't. Did I sit down to practice music, no I didn't. But I did what millions are doing everywhere in the world. Looking at other people, through something called the social lens. Today people could spend hours just looking at a news feed which gives you all kinds of information, or they could be reading what others are doing and where they are going or planning to go, or whom they are seeing, or pictures of their perfect life. 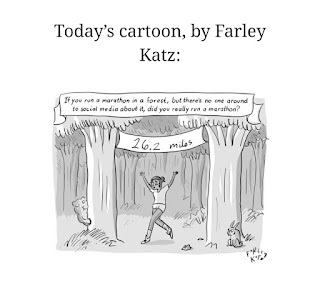 Everything I do, I do it for Fb... or Twitter, or Instagram.. As the NewYork Times cartoon so rightly questions, our urge to share and document everything on social media. If I do not document it, did I really do it! I was wondering about a time when there was literally nothing. Why go very far away, we grew up without social media. Werent we happy. We climbed more trees than todays generation. Wait wait, before I go off into a generation philosophical dialouge, which is certainly not why I am writing this. The real question is, are we asking ourselves before doing something, before accepting another invite, before posting another activity of mine of FB, "why am I doing this". Yes i look great sitting on stage, having fun at a party, lighting lamps, climbing a mountain, no denying. But did I want to do all those things at all?!? So next time, I am definitely using a trick to decide what i want to do. A) Whenever I am in a dilemma about what next, i am going to ask, is this for myself, or is it for a photo op? b) My heart knows the answer, if it shouts, photo op, photo op, I drop the plan, and dig deep into what i really want to do. c) I actually do what I really want to do, even if it sitting at home and doing nothing, than go somewhere only for a photo op! d) Does this make me sound depressed? Who cares! I think I am waking up, and I want others also to wake up and thus i am sharing this as an insight inspired by a cartoon in NEWYORK TIMES.